Photo: US Department of Energy. Open US ’government work’ (cropped). With only a few weeks remaining before the 20 July deadline, the Barack Obama administration issued a warning to Iran that it must accept deep cuts in the number of its centrifuges in order to demonstrate that its nuclear programme is only for peaceful purposes. US officials have argued that such cuts are necessary to increase the “breakout” time — the time it would take Iran to enrich enough uranium to weapons grade level to build a single bomb — from what is said to be two to three months at present to as long as a year or even more. Tehran has made it clear that it will not accept such a demand. Dismantling the vast majority of the centrifuges that Iran had installed is a highly symbolic issue, and the political cost of acceptance would be extremely high. But a closer examination of the issues under negotiation suggests that the ostensible pressure on Iran is part of a strategy aimed at extracting concessions from Iran on the issue of its longer-term enrichment capability. The Obama administration has been aware from the beginning of the talks that the “breakout” period could be lengthened to nearly a year without requiring the removal of most of the 10,000 centrifuges that have been used over the past two and a half years. US officials were well aware that reducing the amount of low enriched uranium and oxide powder now stockpiled by Iran to close to zero and avoiding any future accumulation would have the same effect — and that Iran was willing to accept such restrictions. Washington knows it faces a tough sell trying to get Iran to accept the US insistence on reliance on foreign suppliers. David Albright of the Institute for Science and International Security and Olli Heinonen, the former International Atomic Energy Agency (IAEA) deputy director general for Safeguards, warned in a 3 June article against a deal that would allow Iran to have more than 4,000 centrifuges in return for reducing its stocks of UF6 and oxide powder (UO2). But they acknowledged that, if the Iranian LEU stockpile were reduced from the present level of 8,475 kg to 1,000 kilogrammes, the breakout time for 10,000 IR-1 centrifuges would be six months. And if the stockpile were reduced to zero, the breakout time would increase to close to a year, according to one of the graphs accompanying the article. Experts from the Department of Energy as well as from the intelligence community certainly briefed policymakers on the fact that lengthening the breakout timeline to between six and 12 months could be achieved through reducing either centrifuges or the stockpile of low enriched uranium (LEU), according to Steve Fetter, who was assistant director at large for the White House Office of Science and Technology from 2009–12. Eliminating the existing LEU stockpile and avoiding any further accumulation is the intent of an Iranian proposal formally handed over to EU Foreign Policy Chief Catherine Ashton by Iranian Foreign Minister Mohammad Javad Zarif in Istanbul last month. Under that proposal, which Zarif revealed in an interview with IPS in Tehran 3 June, Iran would convert all UF6 to Uranium oxide powder (U02) and then convert the U02 to fuel plates for Bushehr. In the interim agreement, Iran committed to begin converting UF6 enriched to 3.5 percent to oxide powder as soon as its line for such conversion became operational. The Enriched U02 Powder Plant began operating in May, but the time required to reduce the existing stockpile to zero will depend on the capacity of the plant, which has not been announced. Zarif told IPS he had unveiled the basic idea underlying the Iranian proposal in his PowerPoint presentation to European officials in Geneva in mid-October. An agreement to freeze the existing level of 10,000 operating centrifuges while reducing the LEU stockpile to zero could place the 9,000 centrifuges that have never been operated in storage under IAEA seal. Those used centrifuges include 1,000 advanced IR-2 centrifuges that are estimated to be three to five times more efficient than the IR-1 model. 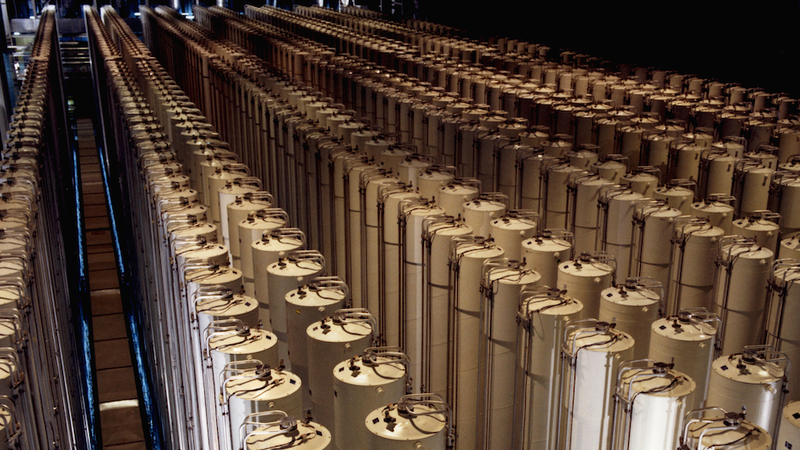 Iran’s policy of introducing thousands of centrifuges into the Natanz and Fordow enrichment facilities that were never used was aimed at accumulating negotiating chips for eventual negotiations on its nuclear programme. In late August 2012, a senior US official told the New York Times that Iran was being “very strategic” by “creating tremendous [enrichment] capacity,” but “not using it.” In doing so, the official said, Iran was acquiring “leverage” — obviously referring to future negotiations. During the round of negotiations in Vienna in June, however, the draft tabled by the P5+1 apparently called for cuts going well beyond what US officials knew would be acceptable to Iran. US officials told the New York Times that the objective was now to lengthen the “breakout period” to more than a year — thus going beyond what Kerry had suggested in April. The draft may have included an even more extreme demand from the French government. French Foreign Minister Laurent Fabius declared in mid-June that the West wants to cut the number of centrifuges to “several hundred”. After the June round of negotiations, Zarif denounced the draft as containing “excessive demands” which Iran would not accept. The November 2013 Joint Plan of Action provided that the future enrichment programme would depend on Iran’s “practical needs”. Iran interprets that term to include the need to be self-reliant in providing reactor fuel for Bushehr, whereas the Obama administration argues that Iran can and should rely on Russia or other foreign suppliers. Given the past record of political interference in fuel agreements Iran had negotiated with French and German firms in the 1980s and with Russia in 2005, however, Washington knows it faces a tough sell trying to get Iran to accept the US insistence on reliance on foreign suppliers. The “practical need” criterion suggests that Iran would have to provide concrete evidence of its need and ability to provide the fuel rods for the Bushehr reactor when the current contract with Russia expires in 2021. Postponing the negotiations over that issue until a date much closer to 2021 would offer a period of a few years to negotiate an agreement on a regional fuel consortium for the Middle East that would be acceptable to both sides, as has been proposed by a group of Princeton University scientists and scholars. Perhaps even more important, such a postponement would allow for increasing trust through the successful implementation of the agreement covering the next few years.